When Paddington Deli & Epicerie first appeared on Latrobe Terrace early in 2014, we were a little excited. 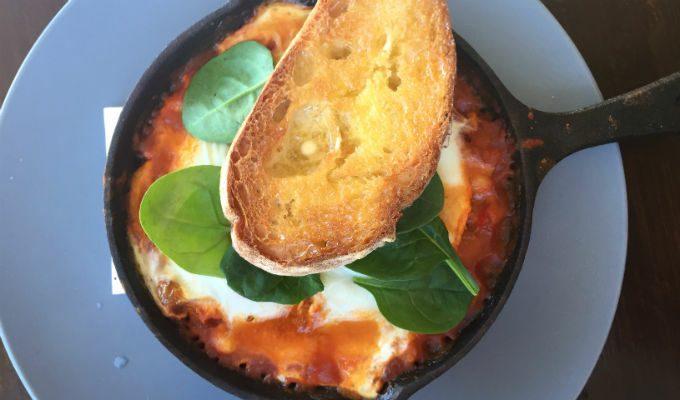 Somewhere to stop in for breakfast (their baked eggs are some of the best in Brisbane! ), pick up lunch and stock up on a few goodies for weekend wine and cheese time? Our regular Paddington visits just got a whole lot tastier. Owner Annie Pease didn’t stop there, soon offering Christmas hampers full of gourmet goodies, tasty baked goods from makers across town and now, eats and drinks on Friday and Saturday nights, just in time for summer catch ups. Along with their new range of house made meals like pastas and pies, it all combines to make a little slice of foodie heaven. 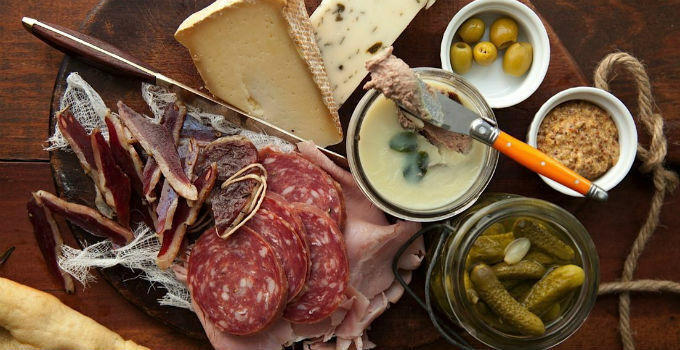 We just had to know more about this haven of brunch and charcuterie, so we had a chat to Annie about how Paddinton Deli & Epicerie came to be and what to expect from the gourmet destination. Describe what it is you do so well in a sentence, and don’t be modest. We have created a little bit of Paris for Paddington with the beautiful foods we serve and our bistro fit out – it packs a punch of personality! How did the Paddington Deli come about? It started as a crazy dream – as do all foodie adventures! For years I wanted to open a gourmet deli-café. I have family in the fruit and vegetables business and I just loved working for them so it is something I really wanted to do for myself. The space became available and I fell in love with it and let my creative juices flow – culinary and design wise! What has been your greatest challenge since you opened? Probably being away from my cute little family on the weekends. My children are young so that part has been challenging (probably more so for my hubby!). But as small as they are, they tell me that they are proud of the deli, so that is reassuring! In the first 6 months or so of the deli I wouldn’t see them all day and get home to tuck them in and end up just fall asleep beside them. I just missed them so much. What inspired your love of food? Working with my family in fruit and vegetables and being around the fresh produce. I still love walking into their massive cold room! I used to take home big boxes of mixed vegetables and cooking up a feast for my flat-mate at the time. I also loved cooking family recipes with my Sitty (Arabic for Grandmother) on her farm or when she came to stay with us and we would try something new. What is your proudest achievement to date? Creating a place for people to come to indulge their senses (both gastronomically and visually). I really think that the deli is one of the most beautiful spaces this side of Brisbane and our food and coffee offering is always improving. We have changed our offering so much since we opened our doors! What does a typical week at work involve for you, besides “Full on!” On the weekends I like to be at the Deli – I love to see my regular customers. This year I am trying to spend more time with my children, but I still work pretty much 7 days a week one way or another (either at the deli or working on the business from home). During school hours I spend my time on our other non-operational aspects of the business, like finalizing our Christmas hamper range, working on our online store or preparing for our dinner service which just started! What does the future hold for Paddington Deli and Epicerie? A better food and service offering all the time. It is all about continuous improvement and challenging yourself all the time. We just opened for dinner service on Friday and Saturday nights, so that is very exciting!! Are there any local producers or suppliers that are inspiring you at the moment? I just love what our coffee supplier is doing – Fonzie Abbott, a local coffee roaster. It is really distinct and they are very cool people to work with. Relaxed but serious about coffee! Dan loves his motorbikes, surfing and has a really unique style! We are really proud to use their coffee. What do you think of the Brisbane food scene right now? There is a lot going on, that’s for sure! There has definitely been a change towards more street and market foods with the plethora of markets these days, quirky bars providing snack foods and more relaxed dining. What I do love most is the infiltration of more modern, refined European and Middle Eastern style foods and flavours. Brisbane palates are changing. Having said that, last year’s trend of American style pulled pork burgers is still everywhere… What do you love most about your job? Definitely my regulars! Many have become my good friends now, and that means a lot to me. We are part of a lovely community in our area and it’s almost like being back in a small town where people stop and say hi and genuinely care about each other! Call me old fashioned, but I just love that part of it. If we took a peek in your fridge, what would we find? To be honest, we are rather simple eaters at home with our small children in control of our culinary choices half the time! Often it is something from the deli that our chefs have made like one of our gourmet pies or lasagna. We love a protein of sorts and salad or vegetables as the side. So, you’d find lots of fruit and vegetables. The kids like to eat strawberries, mandarins, beans, carrots and the like. They really love raw vegetables, which is great! Where/what was the last great meal you ate in Brisbane? Pearl Café in Woollongabba. I am very familiar and comfortable with a lot of their produce as I can tell we use some of the same suppliers, so I ate a lot last time we went and loved it! Where do you think is Brisbane’s best kept foodie secret? It’s the Paddington Deli of course! Although it’s not a secret anymore is it? Other than that, I have a mate Ben doing amazing things with his new venture, Gnocchi Gnocchi Brothers, at markets around Brisbane. Last time I found him, I had to have 2 serves of the Fungi Gnocchi! Ben only uses the best quality ingredients that he has personally sourced on his foodie tours of Italy (and we stock in the deli). He is there right now in fact…lucky guy! You can get your mitts on a little piece of Paddington Deli & Epicerie at 153 Latrobe Terrace, open for breakfast and lunch 7 days a week, and dinner on Friday and Saturday.